I had epic rides in central Pennsylvania planned for Monday-Wednesday. A winter storm that is bearing down on the northeast for Tuesday and Wednesday thwarted my ambitions. Three full days of riding were planned, hitting Raystown Lake and two days around State College, where many big races are held. I may well be locked out until another year now. I have use-it-or-lose-it floating holidays to burn before December 19. I didn't want to waste a 14 hour round trip to PA for one day of riding on Monday. So I went to Strava and started exploring for something more local-ish. Hmm, what New England area is under-represented in my off-road riding? Much of central and western Mass is. I hadn't been to the Holyoke range in while. Quite techy material there though. I was thinking of a more endurance/over-distance type ride. A loop popped up nearby in Amherst. I knew there was riding around there and I had never been to the college town. A loop several have done, including riders I know, was labeled as "epic." My typical weekend trail rides have been in the 40-60 mile range this summer, so I was wondering how a 35 mile ride could be epic. I grabbed the track, made a few tweaks to it, and loaded it into the Garmin 705. It was even colder getting up on Monday than it was on Sunday. Dang. At least the wind died down some. Might as well start getting acclimated to the ski season while still on the bike. Nothing like a good freezer burn to the lungs first thing in the morning. At least it got above 20F by the time I got to the trailhead in Amherst. I had no idea what kind of trails the route followed. Zero intel. Turns out it follows bits of the Robert Frost and M&M trails and whole bunches of logging roads, ATV tracks and forest service roads. I was a bit dismayed heading to Amherst to see a pretty good dusting of snow on the ground. That over oak leaves ought to prove interesting. Oak leaves on smooth granite. At least I was going up. Heading out, the route goes into an immediate 700ft climb. Some of it was super chunky at 20% grade. Yeah, that seared my lungs alright. The steeper bits of the descent where somewhat terrifying. Oak leaves covered chunder, which is unpredictable even when you can see it. Then mix a little snow in with the leaves, well, I might as well have been on a toboggan. My reward for all the hard work was achie wrists from death gripping the brakes. This would repeat over and over. The route had a pretty remote vibe to it. I had big blocks of time where I encountered no one. Never saw any hunters, which surprised me. The climb up Mt Toby was the high point of the ride for me, literally and figuratively. A well maintained forest service road led to the fire tower up top. There was a view from the tower, but I chickened out climbing to the top of it. The steps appeared a little too weathered for my liking. The five mile descent from Mt Toby was quite good too. The first half was more leaves over chunder death grip braking, but the bottom half was more like a jeep road run-out. A short climb at the 26 mile mark pretty near killed me. I cleaned it, but just barely for like five minutes straight. I was shot after that. The track I grabbed from Strava was from a Garmin 500 and of very poor quality. This proved frustrating numerous times. I'd be riding along, 200ft, 300ft, sometimes maybe more than 400ft off the track, following the only trail or road in the area. Then I'd come to a split and had no idea which way to go, as the track I was following was junk. I'd pick one, and after several hundred feet I could begin to see if it was right or wrong. Too often I picked the wrong way. I had hoped to add Sugarloaf Mtn and the Deerfield Ridge across the Connecticut River to the ride, but my progress was pretty pathetic up to this point. I'll have to wait for a non-leafy day for that. For D2R2 riders, the Deerfield ridge is that tall, long ridge line you see across the parking cornfields to the east. A trail runs across the top of the ridge. Late in the ride I hit another piece of the Robert Frost trail. It went up on a rocky ridge and went up and down fall lines. A couple pitches were even challenging hike-a-bikes. Mentally, I was ready to be done with the ride. Then it occurred to me, I grabbed a Garmin 500 track, and Strava recalculates distance with these devices. The actual distance might be much longer than 35 miles and I might have twice as far to go to get back than I think I do. Ugh! The route passed through many parcels of land, some state, a lot of local conservation land, and some private. There were random sections of honest singletrack sprinkled throughout, but it was mostly wider tracks used by ATVs, forest access or logging. Quite often a single track was beat down on the wider trails. It was good to close the loop a couple miles or so out from the car, as I knew it was all downhill from there. I finished with 39mi, 6200ft of climbing, in 4.7hrs moving time. I expected about an hour less moving time. This ride beat me to a pulp despite riding my sofa bike. Some of that is probably due to apprehension on the leafy, sketchy descents. I'd probably do this loop again, before leaf drop, and after a long dry spell. I suspect many sections are susceptible to muddiness. On Monday, the ground, and even some stream crossings, were frozen solid. Many a mountain biker, trail runner or other off-road enthusiast has grumbled about the accuracy of Strava segments. Strava too often will miss the start of a segment you "know" you KOM'd. Circuitous segments are prone to being truncated, where a complete chunk of distance (and time) gets conveniently omitted from oblivious KOM takers. And most offensive is Strava depriving almost everyone that ventures off road of 10% or more of their hard-earned distance. What's up with this? I will attempt to explain what is going on. I will start out by stating much of it is not Strava's fault. There are a plethora of devices out there, and many have suspect accuracy at best. Strava attempts to keep the playing field as fair as possible, which invariable leads to at least some users being penalized while not rejecting other users outright. Just in the last few years, there's been an explosion of devices the athletic community uses to log route, distance, energy expenditure and more. First there were GPS devices using the original US military constellation of satellites. Then there were smart phones, using hybrid positioning from dumbed-down GPS receivers and triangulation off base stations. Now we have GLONASS, Russia's satellite positioning system that most new smart phones and GPS devices are compatible with. For sensors that work with GPS enabled devices, we have heart-rate monitors, altimeters, speed and cadence sensors of all sorts, many types of power meters for bicycles, foot pods for runners and much more. These sensors link up via a variety of wireless interfaces, but Ant+ Sport and Bluetooth are the dominant ones. So now Strava is faced with a hugely diverse source of data streamed up to its servers. In a single workout, there can be several redundant, conflicting sources of data. Should strava use the device's barometric altimeter for elevation data, satellite derived elevation, or calculate it from scratch from the GPS track? What about power? Power can be measured by a power meter or calculated on climbs. Then there is distance. A wheel sensor can count exact number of wheel revolutions, while distance can also be calculated from GPS Lat/Lon data points. The question here is, what is truth? Absolute truth is unknowable. There are only degrees of trust, or goodness in the collected data. I'm going to focus on distance here, as power and elevation are topics that each require separate deep dives. When GPSs were first used as cycle computers, off-road riders were dismayed with the distance accuracy. You compared the distance from a wired cycle computer that you hadn't yet removed with that which the GPS measured, and the GPS was 10%, sometimes 20% or even more short. WTF?! Well, there's a lot going when measuring your drunken-ant meandering with satellites whizzing by at 9000 mph, 12,000 miles up. There's noisiness in the data, and a lot of averaging is going on. Some of your little squiggles look like noise and get averaged out. That is where you get gypped. The system was never designed to produce the kind of accuracy needed to resolve tracks like these with $200 devices on your bike. The DistanceMeters tag value normally gets calculated by the GPS receiver based on how much distance was traversed since the last track point. But when a wheel sensor is present, Garmin replaces the distance value with data derived from the sensor. My newer Garmin 500 produces a slightly different .TCX entry. It omits the SensorState tag and adds an extensions tag with other info. "Also during the upload process, the Strava uploader detects any outlier GPS data that may be present in your file - this includes inaccurate GPS points and data that is clearly inconsistent within the file. This bad data detection is an effort to improve the quality of uploaded data on Strava, and does solve many issues with GPS inconsistencies. If, and only if, outlier/bad GPS data is detected, the distance calculation will be reprocessed automatically based on your GPS coordinates (see "GPS-based, Strava post-upload approach" below). This reprocessed distance can differ from the distance data originally reported by the Garmin device, especially if a speed sensor is present (see "How to gather distance data" below). To request that your distance be reverted to what your Garmin device reports, please submit a new support ticket, titled "Revert Distance" and include the relevant activity URLs where you would like the distance to be reverted." I highlighted in red the key statements here. In other words, Strava knows best. I find it odd that Strava always deems my Garmin 500 distance as bad, while my Garmin 705 distance is always accepted. I note that my 705 produces considerably more accurate tracks than my 500. This is especially noticeable when doing laps, or riding both sides of a road in a given ride. Lap points fall right on top of each other, while riding both sides of a road my points stay clearly segregated to each side of the road. Look at an iPhone track in these cases, and points will be meandering all over the place. I believe the 705 is still the best cycling GPS Garmin has produced to date. None of the newer offerings produce as clean of tracks. My 500, while producing cleaner tracks than an iPhone or Android Strava app, does frequently produce outlier points. For this reason, I believe Strava rejects its distance numbers. Strava seems to be agnostic to where distance came from, whether satellite based or wheel sensor based. If the GPS track is suspect, distance is gone, and Strava recomputes it from scratch using "cleaned up" GPS data. In this case, you totally lose on distance, even though your distance data was probably better than 1% accurate. I sometimes wonder if Strava just blanket rejects Garmin 500 distance data because the 500 produces questionable quality track data most of the time. I don't think Strava has ever accepted my 500 distance data, even when the track looked perfect. Then one time Strava accepted my 705 distance data, even though I had an obviously wrong wheel calibration setting. The track was clean though. Go figure. Next I'll present a couple case studies. The first is from our Merrimack 50 ride a couple weeks ago. 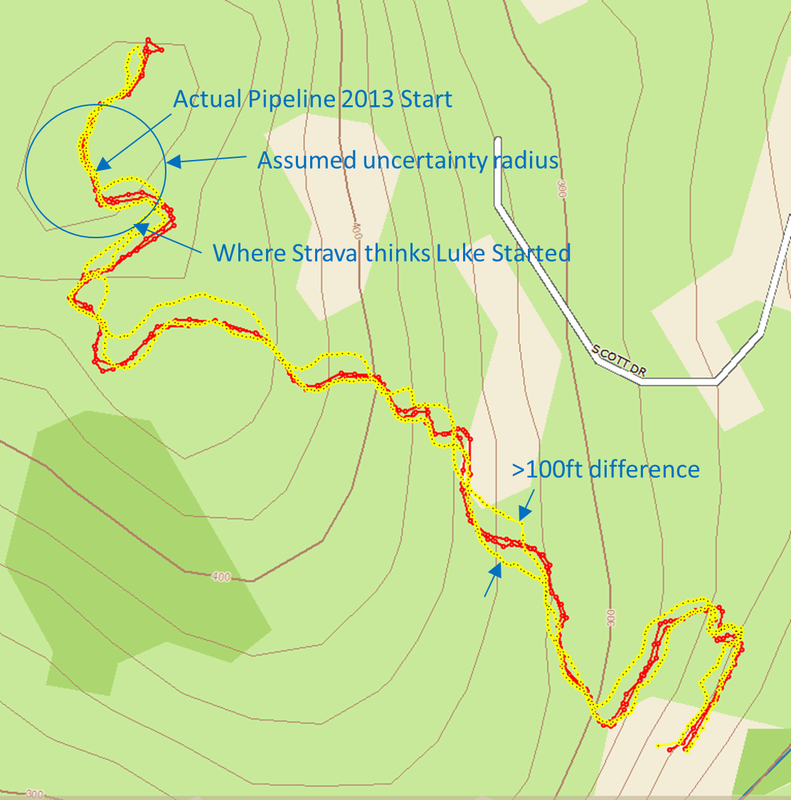 Ten Strava users road up a trail called Pipeline and back down again. This is a perfect case study, as these 10 tracks were on identical conditions on the same day. Things like tree and cloud cover can adversely affect GPS accuracy. Of the 10 rides, there was diversity in GPS units, from smart phones to 500's to my trusty 705. The red track up and down Pipeline Trail is from my Garmin Edge 705. Luke recorded the yellow track with his iPhone Strava app. We both used wheel sensors with our respective devices. Note the red 705 trackpoints going out and back almost lie on top of each other. The repeatability of my 705 is excellent, something I notice lacking in Garmin's later offerings. The yellow iPhone track is of dubious quality upon inspection. Assuming Luke wasn't just free-ride meandering through the forest, there is considerable error between the two tracks here, more than 100ft difference in many places. When we look at the distance Strava gives Luke and I on the descent, Luke gets 0.63 miles, I get 0.80 miles. Luke is appears to be getting robbed 21% just in this segment. But there's more. Strava lops off the first three turns at the top of the segment, so he loses some of that distance right there. Luke's iPhone position is off here, and because the trail loops back on itself, Strava doesn't have Luke starting the segment until he is clear of the uncertainty circle that Strava puts around each segment start and end point. I do not know how big these are, no doubt a highly kept secret. Strava doesn't need anybody looking behind the curtains to see how much dirty laundry there is back there. Not that a distance error by itself does not impact leaderboard accuracy in itself. Only time traversing the segement matters. To get accurate time, the GPS (and Strava) must accurately time stop the start and stop points. Distance in the middle can be rounded away, it won't affect the clock. As you can see, there are multiple sources of inaccuracy in Strava segments. Segments can be poorly defined, in that GPS devices do not have enough position fidelity to prevent short-circuiting portions of a segment. This is primarily a problem off-road, whether cycling, skiing, running, or especially a cyclocross course. But there are also problems on the road, where sometimes your GPS track never passes through that start or finish uncertainty circle and you end up killing yourself for nothing going for that KOM. And what if the segment creator used an iPhone that recorded a crappy track that day? Then many people with good tracks might never score in that segment. I believe Strava should restrict which devices can be used for creating new segments. "When mobile data is synced with our servers from the iPhone or Android App, Strava runs a GPS-based distance calculation on the GPS coordinates, as we do not currently gather data from a speed/cadence sensor from the Strava App." I wonder if that has anything to do with the track accuracy of these devices... It seems to me there would be a way to at least salvage the sensor data and give the rider credit for her distance. This can be remedied. If Strava can't figure it out, perhaps they should hire me to fix it. Here's a second case study. Last weekend we did a 50 mile trail ride through Willowdale. I brought my Garmin 705 again, and to prove my suspicions, I also brought my Garmin 500. Both used a wheel calibration of 2278mm and were synced up to the wheel sensor. As you can see from the photo below, the two agree on distance and time to within a fraction of a percent of each other. The wheel distance data is placed in the .TCX file, which I uploaded from both units to Strava (actually, I used Garmin Training Center to convert the 500 .FIT file to a .TCX file). What do you think was the result? Strava used my 705 distance and threw away my 500 distance! It was the same distance from the same ride from the same wheel sensor! Because Strava doesn't let you upload duplicate workouts anymore (I had to load one, delete it, then load the other), I put Strava screenshots below for comparison, the 705 first, 500 second. Strava shorts me over 10% on distance even though I used a wheel sensor with the 500. I may send Strava a link to this post to see what gives, if this might be fixed anytime soon. I really can see what in the 500 track would cause Strava to reject my devices recorded distance data. On a side note, another thing I notice is Strava always uses my 500 barometric altimeter data, while Strava always recomputes my 705 elevation data, just the opposite of distance! This is maddening. The fall of 2013 just keeps on giving and giving to the mountain biking community. Cyclocross racers who thrive in greasy, muddy conditions must be hating this season. I suspect most races have been dusty dry. Pitty I haven't done a single CX race this year. I certainly do not thrive in greasy conditions and wouldn't mind jumping into one race, but the economics of renewing my USAC for single 40 minutes race locks me out. Fall is my "off" season anyway. By the time Christmas rolls around, I'm probably at my lowest fitness of the year. I don't roll off much, but I do little to no VOmax work this time of year. Instead, I ride for pure enjoyment, burning down the fitness I accumulated over last winter on skis and over the summer on the bike. This Saturday, three of us enjoyed yet another 50 mile MTB ride on a perfect day. How often do you get to ride in shorts in mid-November and finish with shins covered in dust? Just awesome. Dave, Soups and I hit the GWB (Georgetown-Rowley, Willowdale, Bradley-Palmer) loop again, the same course the three of us rode in August. I'd have to say that is one of my favorite local rides, along with the 50+ mile Massabesic-Bear Brook loop. Both offer boat loads of flow and just enough tech to keep it interesting. Leaf drop is pretty much complete now. That added an element of sketchiness that was not present in August. Dave was on his rigid with road friendly 2.0" Geax AKA tires. Soups was sporting monster truck tires, 2.4" Maxxis Ardent's. I was somewhere in the middle, having just mounted new 2.25" Schwalbe Racing Ralph's. Can you guess how this turned out? We went out pretty hard, with a bit of pavement and a lot of carriage track in the first 15 miles. It didn't take long before knee warmers came off. The cloud cover dissipated, giving way to a perfect bluebird sky. Bombing down "Skull Face" in Bradley Palmer, Soups just took off. I was on the cusp of smacking up with a tree continuously with my RR tires not gaining traction in the leaves. Soups claimed it was his tires, but I suspect there was a lot more to it than that. Soups no doubt brought his CX skills to the game as well. Dave, with his gravel grinder tires, experienced even more near death experiences. This became the pattern for the rest of the ride. After topping water off at the Cumberland mid-ride, we headed into Georgetown-Rowley. The most challenging terrain is saved for last, when the fatigue begins to skyrocket. Lots of tight trails in there, and not flat either. Dave suffered a boo-boo early in GR, I suffered a mishap as we left GR. Deep leaves on ATV trail masked loose orange-sized rocks around a turn that instantly spit my bike out from under me. Of course, I landed hard on the wrist I fractured in August. At first I feared for my scaphoid, but I think maybe I just "loosened up" some scar tissue in there. Soups was not having any of these difficulties with his behemoth tires. Perhaps size really does matter. With a bit more down-time than usual due to a broken chain, crashes and frequent bike set-up induced re-groupings, the sun was getting low in the sky as we finished. Actually, this time of year, shadows stay long, even at noon. Starting with long layers, shedding them mid-ride, then feeling the need for them again as we finished stimulated the senses. Have to love days like that. I finished with 50.9mi, 4400ft in 4.4hrs moving time on my Garmin 705. This was about two minutes faster than in August, despite leaf drop. I used a wheel sensor. I also ran my Garmin 500 linked to the sensor. Both recorded same distance (within 0.2%), yet Strava ignores wheel sensor data with the 500, shorting me 10% on distance. Only the 705 data is posted on Strava right now, as Strava no longer lets you post duplicates of a workout. I will post on Strava distance inaccuracies later this week. In the mean time, here are a few pics from the ride. Dave on lots of leaf cover in Willowdale. Soups with no fear of washing out in leaves. Who is this bearded man? A flannel shirt and overalls would complete the look. The Bully organized another MMK50 (Merrimack 50 Mile) MTB ride this fall. Last year's ride fell short of the full 50 miles. This year a full 50 was promised. NEMBA has been very active with trail building in town, so there were many additions to include in the loop. It's always fun to ride new trails for the first time. Spoiled with many consecutive dry weekends, the weather has finally turned more fall-like. After my sorry saga on Friday where I attempted to ride half the Rapha course in Vermont snow squalls, I didn't need another disaster of a ride in the same weekend. Some forecasts called for 50% chance of precip on Sunday, and radar was showing patches all around. That wasn't enough to deter 11 riders from making a go at Shawn's loop. Matt, John, Carl, and Steve in front. All photos by Shawn Smith unless stated otherwise. Unfortunately for Shawn, he suffered a hamstring injury playing football and was unable to ride. That had to just kill him, putting so much planning into the route and leaf blowing trails in preparation. He at least participated by shadowing us along the route, providing food, clothing drop support and photography. We rode the loop mostly in reverse from last year. I had ridden portions of the loop only that one time before, so it was going to be pretty much new to me all over again. The network in Grater Rd Parcel continues to grow. We hit a freshly minted new trail to start, before hitting Salamander and Millipede. The new trail has not been named yet. Millipede is a fabulous trail, and devoid of leaves made it all the more fun. We looped by Wildcat Falls, connected with the power lines, then headed towards Pipeline Trail. We suffered our only mechanical of the ride, a flat. Shawn's route had us looping around on roads to the top of Pipeline. The group consensus was f' that, let's just ride Pipeline as an out-and-back and cut out 4 miles of pavement to ride a 1 mile downhill. Nearly brought a tear to my eye, as riding up Pipeline is a worthy climb. Halfway into the ride, my legs were pretty toasted already, so no PR on the climb. But chasing wicked fast guys down, I did PR, my only PR for the ride. Shawn had the truck with food and water waiting for us on Greens Pond Rd. After topping off, we headed to the Fidelity trails. Keep in mind that if you want to follow this loop, the Fidelity trails are posted no trespassing. We were guests of employees in our group. About 30 miles in, some cracks in the physical integrity of the group began forming. Two peeled off on Continental Blvd. I was leading for a while. Guess I didn't follow Shawn's original script, as we were to take more road to head into the Greens Pond Trails. Instead, I cut across Continental and went into the parcel the back way. That would take a bit more out of the planned 50 miles. After riding the Greens Pond trails, three more riders split off as we headed into Horse Hill. Now I wasn't feeling too chipper anymore either, and only the fastest guys were left and showing no signs of slowing down. Of course, smaller, faster group also meant less regrouping time and faster average pace. I ride Horse Hill on my lunch breaks. At speed, many trails demand high cardio output. 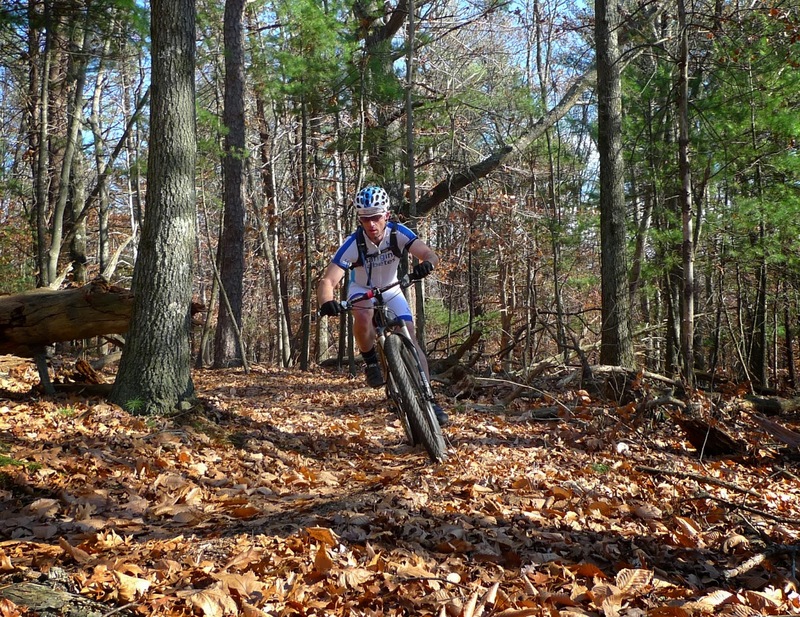 Whether it be climbing or frequent acceleration, you will get worked over in Horse Hill. Trying not to totally lose contact with Steve leading had me seeing cross-eyed. With heavy overcast and getting late in the day, there wasn't going to be much light left. We didn't quite hit everything in Horse Hill, but at least most of the good stuff. I was glad to be heading out. We finished by riding the Dahl Green Area ridge with a leaf blown descent back to the house. Rain never materialized, except for a couple sprinkles. My wheel sensor managed to stay intact this time. My Garmin 705 logged 43.4mi, 4000ft climbing, in 4.2hrs. Many thanks to Shawn for organizing the ride, providing support, and vittles at his house post-ride. Here's a random photo dump from the ride. Initial off-road plummet on the power-lines. At speed, struck fear in me. Not sure what parcel this was, don't think I was in there before. Matt on the Grater Rd trails. Steve on Salamander(?) in Grater Rd. Curt on Millipede in Grater Rd. pressure on. Hamburger bell on bar. Always food on my mind. Isaac St Martin found the bell for me. Food stop on Greens Pond Rd. I'm asked many times per year how I get my bike to destinations. This just came up again, so I'd thought I'd dedicate a post to it and share everything I've learned over the last 15 years. This way, I can just refer to this post, which I might update from time to time. I will focus on continental US travel, although I've been to the Hawaiian Islands a couple times and Europe once. Bringing a bike with you on a plane used to cost little to nothing. Today it is not uncommon to charge more to take a bike with you than for the airfare itself. My preferred airline for domestic flights is Southwest. They recently raised their price for bikes to $75 each way. The is much cheaper than the $200 some airlines charge. While cost may be a deterrent, it is not the main reason why I avoid taking bikes with me on planes. Back around 2001, just after 9/11 I believe, I had an incident at LAX coming back with my Dean Titanium hardtail. You see, bike boxes are too big to go through x-ray machines. They must be manually inspected. This means the entire contents of the box comes out. You may have spent an hour meticulously layering things up in there, but that is not how it's going back into the box. In my particular incident, the bike box was inspected in front of me while I waited. The pieces did not go back into the box in the right order, and the box wouldn't close enough to get the buckles to catch. So the guys stood on the box, bouncing, with who knows what jamming into what inside there, trying to get the buckles to latch. I called out "Hey, what are you doing! Let me put it back in there." The younger guy came over, got right in my face and yelled "You don't tell us how to do our jobs!" The older gentleman came over, put his hand on the younger guy's shoulder and said "Calm down, I'll take care of this." He explained passengers are allowed to touch baggage after it's been inspected, and he'll try to re-position the items in the box. Well, needless to say, there was some minor damage to the frame where the rear cassette destroyed the downtube multi-color DEAN decal. Fortunately titanium is pretty near indestructible. Had it been a modern carbon frame, the frame would have been toast. I've since learned to zip-tie things up a little better, so what comes out of the box has better chance of going back in the same way. I tell this story though, to warn people that they are not the last to pack their box. TSA people in a back room somewhere are. Prospects are not great that it goes back in exactly the way you packed it. Just like luggage, bikes can get lost in transit. Maybe even more likely, as they often can't go through the standard luggage carousels. I've heard too many stories of cycling trips ruined by lost or delayed bikes. This seems especially true for international travel. These days, I would consider taking my bike with me only on direct non-stop domestic flights. I almost universally pre-ship my bike these days. Exceptions are the islands, where there is no truck route option. You have many shipping company options. The two most popular are FedEx and UPS. I know many riders that use UPS and pay over $100 each way. I do not understand this. FedEx is consistently cheaper and offers another benefit I'll get to in a minute. Here's a simple case study. You can go to the respective FedEx and UPS websites and check out other scenarios. I travel from Manchester, NH to Denver, CO a lot. I use a Trico Sports Iron Case. It is specified at 30" W x 48" H x 10" T. The sum of these dimensions is 88". This is extremely important. This used to be the absolute max at FedEx before bumping into oversize fees. It appears recently both FedEx and UPS hold the price up to 90" in size now. My packaged full-suspension mountain bike weighs around 65 pounds. When I plug my dimensions into the estimators, I get $77.30 on FedEx and $89.27 on UPS. This is much cheaper than what most airlines charge now, and nobody is going to rip your box apart at these carriers. However, sometimes the staff use a "generous" tape measure and add an inch or two to a couple of your dimensions. You must always watch out for this. Say you packed your 29er and the box is a little pregnant. They measure the 10" dimension to be 13". Your FedEx $77 fee now jumps to over $155, and your UPS $89 fee jumps to over $170! That is just crazy. What sometimes happens with me is my box is a bit beat up and the seams flare out a little. FedEx will find the maximum of each dimension, and if this adds just 3" to the sum of all three dimensions, my cost more than doubles. I've had to tactfully haggle a few times to get the dimensions to 90" or under. I've yet to pay an oversize fee. If you use a bike box that is greater than 90", you are pretty much screwed with either of these carriers. Most premium boxes out there are well over 90" in sum of dimensions. Might as well fly with your bike in that case, as your bike probably has a much more comfy fit in the box and more apt to back into the box correctly after inspection. I have a FedEx shipper account. Anybody can sign up, it costs nothing. It saves you 15%. When you ship bikes a few round trips per year, this really adds up. This brings my cost down to $65 each way. One downside to ground shipping your bike is you lose the use of it for several days before and after your trip. For someone like me, this isn't a big deal, as I have other bikes I can ride in the mean time. Something to consider though, if you have only one bike. You will be asked if you want to insure your bike. I always decline. Just like buying extended warranties for appliances and cell phones, there's huge profit margins in this for the carriers. My philosophy on insurance in general is that it is for things you can't afford to cover out of pocket. If you are wealthy enough to be travelling to some exotic cycling destination with a $6000 bike, you can afford to replace it if FedEx backs a forklift over it. You can. You'll be pissed, but it won't bankrupt you. On the other hand, if your house that you owe $300,000 on burns to the ground, and you are not insured, you are probably screwed. Insurance makes sense in this case, not your prized bicycle case. I can break my bike down in about 20-30 minutes. This includes completely removing the crankset on a full suspension MTB. I find it fits in the box better this way and is not much more work than removing just the pedals. Very important to remove the rear derailleur and hanger. This will usually be against the case and on bottom wheeled side. Leaving the hanger on there is just begging to start your trip with a bent hanger. 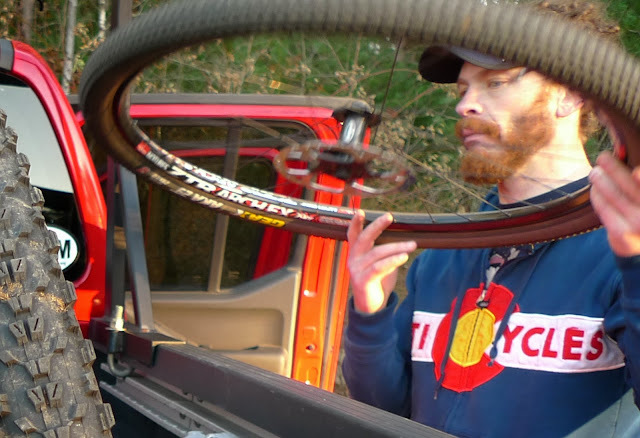 Mountain bikers should always be taking a spare hanger with them too. With hydraulic disk brakes, it is important to place wedges in the calipers so inadvertent squeezing of the levers won't close your calipers, making it impossible to mount a wheel, or worse, push out a caliper and spewing fluid. I also put a spacer in rear dropouts with quick release to retain it. This way if crushing force is placed on broad side of your box, you at least have some extra support there to protect your frame. You can use heavy schedule PVC pipe or a piece of copper pipe cut to 130mm (road), 135mm (mtb) or 142mm (thru-axle). Wrap the carbon bits up in pipe foam and zip-tie it on. Same for handlebar. I remove bar from stem but don't mess with stem on steer tube. Wrap the chain and rear derailleur up in old t-shirt so it don't ding up frame or make a mess. Same for crank if you remove it like I do. I also remove disk brake rotors. Probably not necessary, but I like to carry cassette tool with me and Shimano center-lock rotors are so easy to remove. This completely eliminates any risk of bent rotor at destination. Release partial pressure in MTB tires. Box will close further and reduce risk of oversize fee. Don't let too much out that tubeless bead will break seal, spewing Stan's in your box. Wheels go in last. I zip-tie them together so they overlap a certain way, keeping axles from hitting frame underneath. There are many drop-off and pick-up options. I used to hunt around for bike shops that were willing to receive and hold my bike in the box until I came to pick it up. A few bike shops will gladly do this, and I was sure to stock up on Cliff bars there or throw a ten in the beer funds jar at the service counter. Many shops want a little more in return for handling your bike and will do so only if they can unpack and build it up for you. This may cost as much as shipping your bike. They will also offer to pack and ship your bike at the end of your trip. Some readers no doubt may want full service, especially those not accustomed to doing all of their own bike maintenance. Besides having trouble in some areas finding a bike shop to hold your bike for you, you are also faced with limited bike shop hours. Say your flight gets in at 10pm. Guess what? You're not riding your bike at 8am the next morning. The shop probably doesn't open until 9am or 10am. The day could be half gone before your bike is ready to ride. That's where FedEx comes to the rescue again. A few years back, FedEx bought the Kinko's print store chain. It is now called FedEx Office. Every major city has multiple FedEx Office locations. Many are open 24hrs, or at least have late evening hours. Even more recently, most FedEx Office locations offer "Hold at Location" service. There is no extra charge for this. You just check the box on shipping label and ship the bike to yourself at that FedEx Office location. You can find FedEx locations here. It is always good to call to double-check their hours and that the offer hold at location. When you arrive to pick up your bike, it will usually come out of a locked storage room and you'll be asked to show your ID and sign for it. When I head out on a trip, I drop my bike off at the staffed FedEx counter by the Manchester airport. It's close to work, and I know it goes out that night. I always allow at least two days margin on estimated transit times. If FedEx says it takes four business days, I plan on at least six. Thus if I arrive on a Friday, I want bike there by Wednesday, so I have to drop if off no later than Thursday afternoon the week before. Other riders may cut it tighter than this. I'd rather not risk it. I've never had a bike take more than a day more than estimated ship time. I've probably used FedEx ground for at least 25 round trips now. I've never had an issue. When I return from a trip, I often use the same FedEx office I shipped out to. There is no surcharge to ship from a FedEx Office. Avoid "Authorized Ship Centers," as these are usually independent businesses that will add a surcharge to your standard FedEx shipping charges. I had no choice but to go this route one trip and paid a lot more to send my bike back home, but still cheaper than a plane and with less risk in my opinion. Make sure the staff do not over measure your box and bump you up into oversize fees. I always ship the bike back to my house on the return. I live in a decent neighborhood, and we can't count on somebody being home when FedEx comes by. So I request No Signature Required. You can only do this if you declare a value of $100 or less, which means you are also not insuring your bike. No signature allows FedEx to leave the bike when nobody is home. Things are a lot simpler that way. Depending on your neighborhood, it may be better to have somebody sign for it at your house or send it to your neighborhood FedEx Office center. So that about sums it up. It's really not that difficult. I'll make edits if I think of more. Feel free to comment with your experiences too. When I rode in Blackstone Valley two years ago in November, I knew I would have to return. I didn't think it would take two years though. There is much good singletrack in the valley, something for everybody. Fast, flowy material? Yep. Tight, twisty benchcut? Sure. Chunky downhill runs? That too. Poking around in Strava, I see locals have been organizing 30, 40, even 58 mile rides linking up trails with bits of road. The problem was, Strava now hoards user submitted data and asks for a fee to access said data. I don't have a problem with that, other than I'm cheap and I like stuff for free. Garmin Connect didn't have enough track diversity to put a good loop together, as almost nobody uses it anymore. So I finally ponied up and subscribed to Strava for a year so I could resume data mining. Strava no doubt has the world's largest depository of trail data. I grabbed a few of the longest tracks, brought them into DeLorme Topo, then began splicing a nice 30-40 mile loop together. This time I verified that the track was correctly loaded into my Garmin 705 GPS, unlike last time when I visited Blackstone Valley and had no mapping info whatsoever. Rain over the prior 48 hours never really amounted to much. The trails were still dry, and Saturday was shaping up to be near summer-like. I headed out on the east side of the valley first for the lookout rock. Needed to get that shot with a favorable sun angle. Shortly after, I encountered no trespassing signs. That sucked. There was no obvious way to rejoin my loop by going around. The signs appeared to be placed in the legally prescribed manner, conspicuous, every so many feet apart, and signed by the landowner. I respect that even though it looks like numerous cyclists ride through there regularly. The landowner obviously doesn't want me passing through, plus, trespassing on properly posted land is criminal and can be prosecuted. I did find a way around, which wasn't all that bad, over West Hill Dam. Lots of trails in there, mostly fast carriage roads material, with a fabulous loop of buff, flowy singletrack in the northern portion. Appeared to have been leaf blown too. Next up was an area I see going by different names. Some call it Pudding Hill. There is a 5 mile singletrack loop in there that meanders something fierce. Very tight. Sofa bike was no match. A shorter wheelbase 26" bike would have provided much better agility. I seemed to be in the spaghetti maze for an eternity. Pudding Hill trails. Leaf drop made some of the off-camber side hill riding sketchy. Pudding Hill is where a wheel sensor really makes a difference. The KOM holder Whitkus logged only 3.53 miles on this segment using an iPhone. I logged 5.11 miles with my Garmin 705 and Ant+ Sport wheel sensor. Witkus got gypped 31% here. A short bit of road, which I think can be largely eliminated looking at some additional track info, took me back to the Blackstone River Heritage State Park. This is where some of the best riding material is located, especially on Goat Hill. Is it Memorex, or is it live? Northern part of Heritage SP. After riding the northern loop, I crossed over Rt 122 to ride that loop too. Up until then, I encountered very few rocks. Across Rt 122, it is almost all rocks. The trail often splits into A, B and sometimes even C lines. One could easily get in over their head on some of the features there. My pace was much slower than expected, due in part to leaf drop, but also do the the really slow Pudding Hill loop. I was running out of time and would not be able to hit all of the Goat Hill trails. A single pass over the summit would have to suffice. My ride very nearly came to an abrupt end at the summit, I rode up onto granite, where it looked like the trail rolled down the other side. It was a freaking vertical 15ft drop! The trail actually veered to the left and nobody was riding that drop. Goat Hill, descending north side. Rain and snow never amounted to much over Saturday night either. There were a few flurries about Sunday morning, but no measurable precip. I needed to stay local for something shorter, as I needed to hit the office for a few hours. A good standby is a loop around Massabesic Lake, hitting FOMBA trails along the way. There are myriad ways to add or subtract to/from the loop, doubletrack or singletrack, flat or climbing. I decided to check out a trail I hadn't been on in quite a while. I've heard it go by different names, such as Evil FOMBA, Hanger Banger, Trail X, and No Name trail. It runs about 4mi and pretty much confounds me the whole way. The A-frame bridge is gone, replaced by a tame bridge. But many of the other bridges are hewn logs, and this morning they were slicker than snot. I did not ride any of them. A mellow 24 miles on the sofa bike was had when I finished. Other than being about 30 degrees colder than the day before, it was still very pleasant to be in the woods. Looks like the dry spell will continue. I swung by Hunt's Photo in Manchester on my way back to pick up a new camera. I've been extremely happy with my Panasonic Lumix LX3. Panasonic introduced the LX5 successor a few years ago, and then the LX7 about a year ago. The pixel count of these camera's is only 10MP, but anybody who's familiar with digital photography understands high pixel counts in small cameras usually means poorer photo quality. The LX7 has more dynamic range than my LX3, more zoom and a manual aperture ring. Picked it up for $279.99 with rebate.